The EUP8268 is a highly-integrated mode battery charger with power path management for single-cell Li-ion battery in a wide range of smart phone and other portable devices. It integrates a synchronous BUCK regulator to provide regulated voltage for powering the system output and at the same time charging the battery. This device supports both USB and AC adapter input. 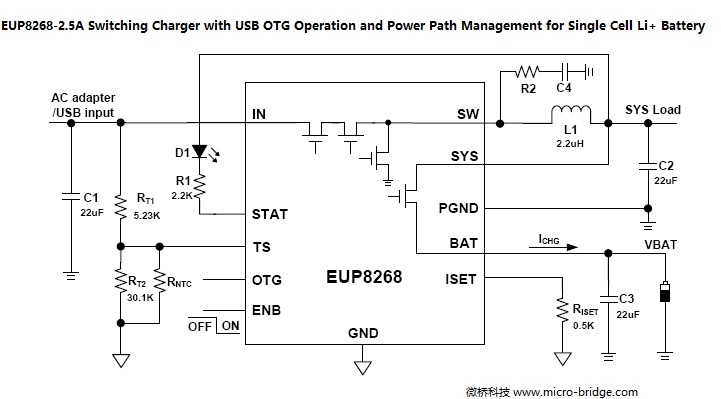 The EUP8268 also meets USB On-the-Go (OTG) operation power rating specification by supplying 5V (typical) on IN. The smart power path management allows EUP8268 to regulate the system voltage for powering an external load and charging the battery independently and simultaneously. This allows immediate system operation even under missing or deeply discharged battery. Additionally, the smart power path control allows an internal connection from battery to the system in order to supplement additional power to the load in the event the system power demand increases over the input limited power or the input is removed. The EUP8268 features high integration with all the power switches included inside. No external MOSFET, blocking diodes, or current sense resistor is required. Status monitor output pins are provided to indicate the battery charge status. Other features include battery temperature monitoring and charging safe timer detector. EUP8268 is available in 3mm 3mm UQFN-16 Package. • Control Loops: Input Voltage Limit, Constant Charge Current, Terminal Battery Control.